More good news was our course getting a mention in The Guardian not once, but twice in the space of a week. Here was a recommendation (from a Leeds University graduate no less) for our course over those at the so-called “elite” universities; and final year student Alex Almond’s report into the State of Blogging in Leeds (the first of its kind) got a mention not just in The Guardian but in the Yorkshire Evening Post as well. 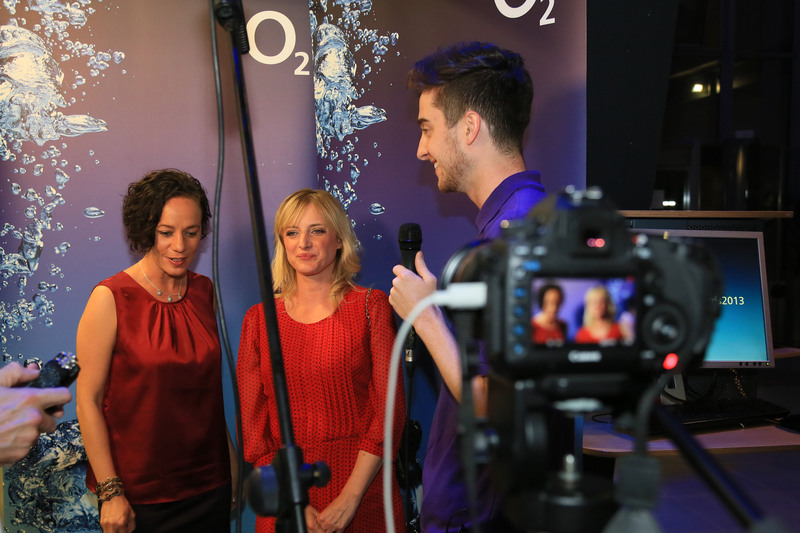 A group of our final year students helped provide coverage of the O2 media awards held here in the Rose Bowl. Charlie Clarke (pictured) was a veritable interviewing machine, speaking to the likes of Dickie Bird, Emmerdale stars Alicya Eyo and Nicola Wheeler, and Bradford City fans Dom and Tom (of Get Ready to Rumble fame). Natalie Casey and Ryan Parrish helped with tweets on the night, and Charles Engwell and Henry Arnold worked like demons to edit the film together the following day. Charles’ final film went onto the O2 website, seen by a huge global audience, and Henry’s edit was used on BBC Look North. We couldn’t have done it without Chris White and Max Ryan from Hugo Smith’s course, who did the filming, nor photojournalism students Thomas Gadd and Rebecca Leggott. And not forgetting 2nd year student Nikolai Baker who organised us al l… See the full slideshow here. 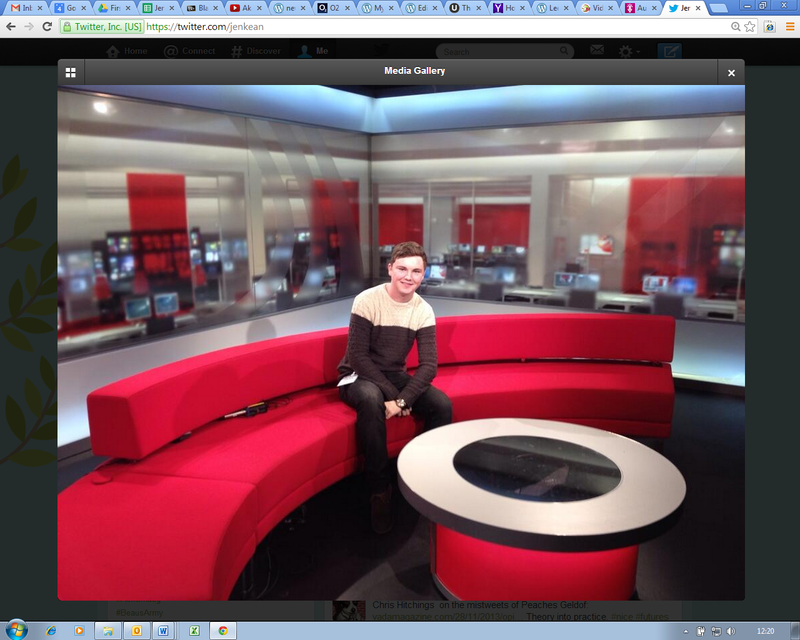 And Chris, it seems, couldn’t resist getting in on the BBC Look North sofa. Our second years are few in number but it’s all about quality. Nassr Adris has been out interviewing rapper Akala (“amazing what you can do with a couple of mobiles”, says tutor Sean), and we recommend this fascinating read from Aimee Robertson, who tracked down an eye-witness to the shooting of J.F. Kennedy to coincide with the 50th anniversary of his assassination. Her first person interview is a model of its kind; the confetti image is one that will stay in your mind, we guarantee. Painting pictures with words. Our final year students are busy busy, producing a range of magazines – we’ll bring you the highlights next semester. 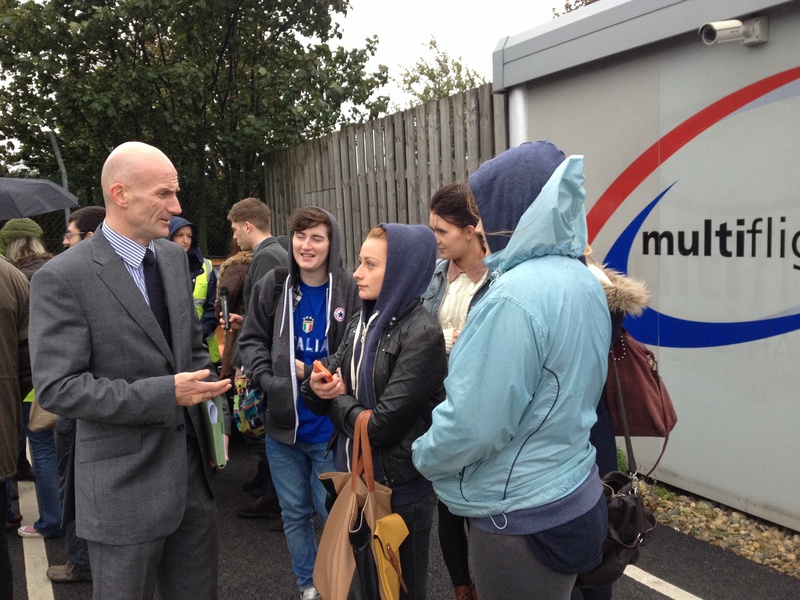 They’ve also been getting to grips with the Leeds business community. Highlights include Alice Booth discovering why Ian Bowden, of Rockstar Games/Grand Theft Auto fame, thinks Leeds is “special”; Alex Price finding out about efforts to get Leeds’ 7,000 empty homes back into use; and Sally Humberstone at the official opening of O2’s new store in the Merrion Centre. Welcome to all our first year students; your tutors report that you’re a lively bunch with plenty of good work in progress. We look forward to lots more of the same. Neil Hudson says he’s been particularly impressed by some of the patch stories – watch this space. Ask Dominic Cazaux why he’s got 11 middle names (clue: how many in a football team and did his dad support Leeds United by any chance? ); and Lucy Chapman how she did on the X-Factor. We’ve got students who’ve lived all over – Saudi Arabia, Kenya, Switzerland … Oh, and not forgetting Barnsley, eh Pete Martin? And if you want the low-down on all the gossip on the tennis circuit, Pete’s yer man. Second year student Carris Boast was a pleasure to have around in the office, according to Kerrang! – and the same was said of Aimee Robertson by the Sunderland Echo, who described it as “a privilege” to publish her first byline. Final year student Charlie Clark had around 70 stories published during his stint at Digital Spy, whilst Media Business Insight had nothing but praise for Sophie DiMauro’s “enthusiasm and eagerness” and predict “a prosperous career in journalism” for her – well done Sophie. Helen Clarke’s been at You & Your Wedding magazine and Punkyduck marketing, whilst we’re told Ewan Smith “obviously has his head in the right place to develop a successful career” following his placement at Reuters. Ciamhne Boakye got some great feedback from the Chester & District Housing Trust, where she worked in the PR & comms office. And Red Bull picked up on Alex Price’s “passion for the industry” during her time with them (we’re guessing snowboarding may have been involved). Lydia Taylor’s blog got her spotted by new Leeds business magazine The Professional, and she’s now been writing for them. We were impressed by Chris Hitchings’ piece for Vada magazine on Peaches Geldof’s tweets – theory into practice or what. Dan Whitelegg has been pretty much running the press office at Altrincham FC, it seems, and final year students David Bowers and Ryan Parrish are now working paid freelance shifts at Skysports as a result of impressing during their work experience there. Jenny Gibbon took advantage of a contact to get some work experience with BT Sport, in addition to getting stories published at the Yorkshire Post. We repeated our successful careers speed dating event this year for second and final year students, and it was brilliant to have some of last year’s and previous year’s graduates to come along and advise our current students. So this time last year, Louise Fletcher and Lee Thomas-Mason were on the student side of the table – but this year they came back as successful employees of Search Laboratory and SkyBet respectively. We also loved having Dan Cholerton back, representing First Ten in Leeds; Tanya Harris from Wireless magazine and also Blueclaw; and Fiona Gribben, now student communications officer here at Leeds Met. Photos courtesy of Carrick Jones. Charlotte Corner, having picked up her Print Futures award from the House of Lords, is steaming ahead with the imminent launch of her own magazine, conceived during her Magazine Project module here a year ago. It’s a mag for the cheerleading community and Charlotte was highly praised by the judges. “Her enthusiasm to create a professional magazine from scratch has earned her this award,” her citation said. It’s been real cloak-and-dagger stuff for two of our summer graduates who secured contracts with the BBC on Watchdog and Rogue Traders as a direct result of doing work experience there last year. We could tell you their names, but we’d have to kill you then – because they were both involved in undercover filming for the programmes and their secret filming was on the telly this autumn. So whilst doing this, we had to delete all references to them anywhere on our website to protect their identities. But well done B**** and G****. Visual clue below – but honestly, our lips are sealed. Elsewhere, Sam Lowrey has been mixing with the rich and famous after getting a job as a reporter for a B2B shipping and cargo publication in Oxford. Think it sounds a bit dull? Not a bit of it. He’s mingled with Boris Johnson and other government bigwigs, and is jetting off to Rotterdam, Hong Kong and Miami in the near future. Also set to travel is Molly Dolan, who’s working as editorial assistant at Sleeper Magazine, a mag for the hotel trade. Jack Carter beat stiff competition to a job at Haymarket publishing, working on a B2B magazine for the business conferencing trade – more travel in the offing, we reckon? Emily-Jane Smith is working as a writer for an IT company, and Aran Dhillon is doing an NCTJ diploma course, and has been interviewing boxer Ricky Hatton. Lee Thomas-Mason is social media editor at SkyBet in Leeds, and Search Laboratory in Chapel Allerton have scooped up three of our graduates – Louise Fletcher, Lauren Tate and Sophie Reardon. Josh Hevicon is writing for Far Out magazine founded by Lee and Roy Pemberton. Aalia Khan has been producing material for Maiden Voyage, including video as well as written content. Alex Hinds is an account executive at The Relations Group, specialising in radio coverage. If you graduated this summer and you’re reading this – let us know what you’re up to. 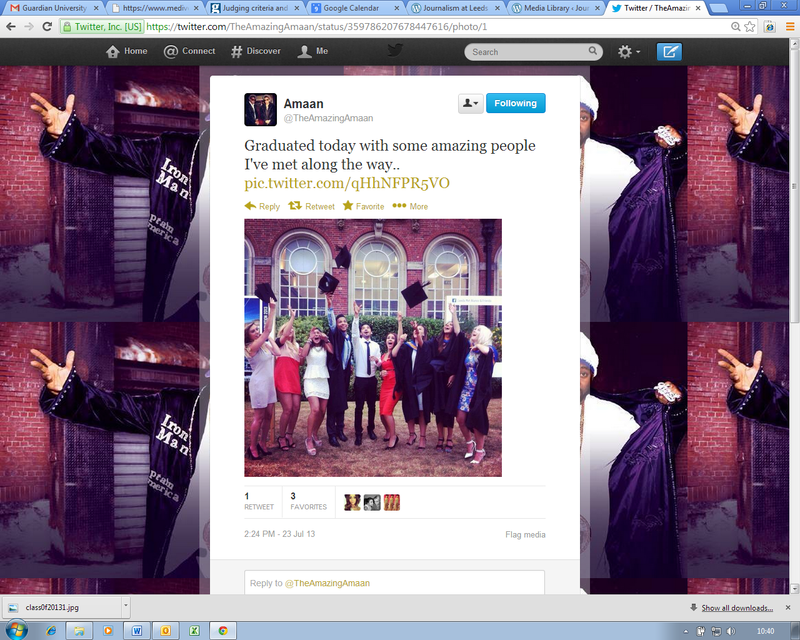 Especially you, the Amazing Amaan. Going back a bit further, Emily Sexton-Brown has bagged herself a job as assistant editor for Outdoor Enthusiast Magazine, whilst Robyn Vinter – who blazed a trail for Leeds Met graduates at Farmers’ Weekly – has now moved on to a senior reporter role at londonlovesbusiness.com. Carmen Bruegmann, who’s taught some of you on Magazine Project, has given birth to gorgeous baby Isabella. Many congratulations, Carmen. In non-baby news, Karl Hodge was shortlisted for a Golden Robes award – voted for by students – in the “Virtual Virtuoso” category earlier this year. “It’s lovely that students thought to nominate me,” says Karl. Well done that man.